Considering American pro-wrestling’s disappointing and problematic history of mishandling its gay and bi characters, it’s nice to hear that Sunday night at Wrestlemania 34 in New Orleans — the annual pay-per-view blowout run by World Wrestling Entertainment (WWE) — Irish wrestler Finn Bálor entered the main arena with members of the local LGBTQ community. 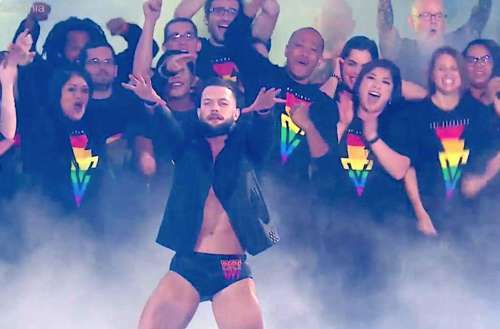 This Finn Bálor LGBTQ entourage wore his rainbow-colored T-shirts, the profits of which partially go to Gays and Lesbians Allied Against Defamation. And he didn’t turn around and mock or bodyslam any members of the entourage, either — progress! It’s also progress that WWE itself tweeted the above image of Bálor and his crew in a tweet that didn’t mention the LGBTQ community but still captured the attention of pro- and anti-LGBTQ fans alike. Bálor also wore a leather jacket, wrestling trunks and boots bearing rainbow colors as well. The last time we heard about a fighter deliberately wearing rainbow gear into the ring to represent the LGBTQ community was Puerto Rican boxer Orlando Cruz wearing pink and rainbow trimmed trunks in his November 2016 bout to become the world’s first openly gay boxing champion. Sadly, Cruz lost that bout, just as Bálor lost his threeway bout last night against The Miz and Seth Rollins to become the WWE Intercontinental Champion. But considering that it’s the first time we’ve seen overt acknowledgement of the LGBTQ community in American pro-wrestling in a way that doesn’t mock or insult us, we’ll take it as a win. And if you want, you can buy the Finn Bálor rainbow tee for yourself. 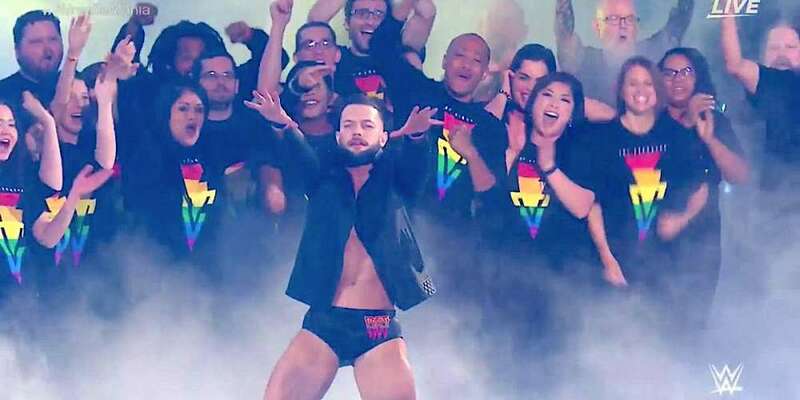 What do you think of Finn Bálor’s LGBTQ entourage at Wrestlemania 34? Sound off in the comments.